Hello everyone, and welcome to another Cricut Cartridge Showcase. Today we have Hattie from Hattie's Haven. Hattie has such a great sense of color, design, and detail. And she brings all of that to her very first Cricut cartridge showcase. Hattie is showcasing the NIFTY FIFTIES cartridge. First up is a ROCKIN’ layout! It was fun to use large sized cuts to accent the pages and play off of the photos! Hotel Sign (page 49) was personalized using the Nifty Fifties font with the name of the school. The sign’s background was created using the Cuttlebug “Swiss Dots” embossing folder. Cat (page 23) was cut at 4”. Instead of cutting the small whites of her eyes I used a Signo White Pigment ink pen (UM-153). Her collar is Magenta stickles. The white background was created using the Cuttlebug “Seeing Spots” embossing folder. Stamp is My Pink Stamper More Punny-licious using VersaFine Onyx Black ink. I really like how using the shimmery silver cardstock looks! The teal background was created using the Cuttlebug “Seeing Spots” embossing folder. A Black Glaze pen was used on the tires to give them a shinny look. Inside sentiment created on my computer. Poodle (page 29) was cut at 4”. Rocket (page 28) was cut at 4”. The white background was created using the Cuttlebug “Swiss Dots” embossing folder. Stamp is Making Memories Giggle Kids Boy (no. 31927)using VersaFine Onyx Black ink. 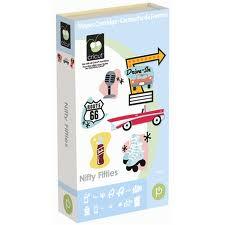 The possibilities are endless with the Nifty Fifties cartridge. It has a fun font and lots of images that can be used for a variety of events!! 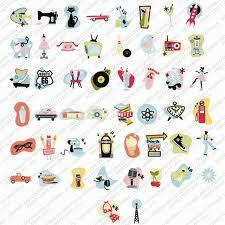 Images include everything from a sewing machine to a Tiki Bar sign! Remember the pink lawn flamingo’s???? Yep, they are in there too! Just looking through the booklet I’ve come up with other ideas for cards and layouts…stayed tuned….you’ll be seeing more of this cartridge! Thanks for stopping by today and I hope you have a "Nifty" Crafty Day! A great big THANK YOU to Hattie for a fabulous Nifty Fifties Showcase. Please drop by Hattie's blog and leave her some fabulous love. You can visit Hattie at www.hattieshaven.blogspot.com. What a marvelous showcase Hattie! Makes me want to put my hair in a ponytail and have a big giant Root Beer Float! Thank you for the wonderful inspiration! Spectacular site!!! The best I've seen yet. Awesome cards and layouts!! ! I am linking up!